The Celtic Media Festival (CMF) has extended the submissions deadline for its International Pitching Forum, which offers a £10,000 development fund prize for the winning pitch. This year’s festival – the 40th anniversary edition – marks the first time that the panellists will select a winner and award a prize as part of the Forum. The Celtic Media Festival is supported by Northern Ireland Screen’s Irish Language Broadcast Fund. The Proposal Pitching Round, which this year focuses on Factual Programming, is currently open. The CMF is welcoming pitches from producers to pitch@celticmediafestival.co.uk until midnight on 31st March 2019. A shortlist of submissions will then be selected for the presentation of live pitches. 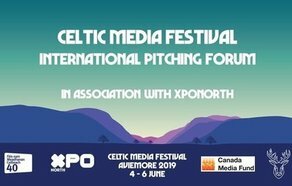 The live pitches will be held at the Celtic Media Festival in Aviemore, Scotland on 4th-6th June 2019 in closed session with only the Forum moderators, the Forum decision makers and the selected producer/team present at each pitch. Successful Canadian entrants will have the opportunity to receive funding in order to attend the festival. Since launching in 2016, The CMF’s International Pitching Forum has grown bigger and better each year, attracting impressive pitches from across the Celtic nations. This year the festival will work with the Canada Media Fund and host delegates from Canada, building on international connections. Canadian producers and broadcasters will attend CMF to take part in the International Pitching Forum, providing Celtic delegates with fantastic opportunities to do business on an international stage. The CMF is an annual 3-day event that promotes the languages and cultures of the Celtic Nations and Regions in media. This year the festival will celebrate its 40th edition in the scenic setting of Aviemore, combining a major conference of seminars and master classes with presentations of coveted prizes in an international competition across all the main content genres in TV, radio, film and digital media. The CMF International Pitching Forum, in association with XPO North and the Canada Media Fund, will take place at The CMF in Aviemore, Scotland, from the 4th-6th of June.